MOSCOW, April 23. /TASS/. Russia and Angola have reached agreement on designing and building an Angosat-2 satellite instead of the lost Angosat-1, the press service of Energiya aerospace corporation said on Monday. Energiya was the developer of Angosat-1. 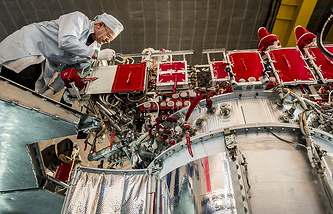 "The sides discussed the terms of a supplement to the current effective agreement, which they signed on April 23, and they agreed to begin works under Angosat-2 project that will be a modernized version of Angosat-1," the report said. Angolan Minister of Telecommunications and Information Technologies Jose Carvalho da Rocha said the agreement would make it possible to get down to development of the satellite virtually the next day. Energiya corporation reaffirmed the intention to fulfill all the items of the contract that envisions creation of a satellite network for telecommunications and broadcasting in Angola, the press service said. "While development of an analog of Angosat is underway, we will offer frequencies in the C-band and Q-band for telecommunications to the Angolan partners," the press service said. "Also, we will render maximum assistance to the Ground Control Mission at Funda in Angola." Russia and Angola plan coordinating the technological characteristics of Angosat-2 shortly, after which Energiya will get down to R & D works, the report quoted Vladimir Solntsev, the director general of the corporation. Angosat-1 telecom satellite was launched on December 26, 2017, from the Baikonur space center on the territory of Kazakhstan with the aid of the Zenit-2SB launch vehicle and the Fregat booster. On December 27, after separating from the booster, the ground control center lost communications with the satellite. The ground control mission made the attempts to regain communications with the satellite through to mid-January 2018 when the latter left the zone of direct radio visibility from the Russian territory. A source in the Russian aerospace industry told TASS earlier on Monday Russia and Angola had signed a supplement to the agreement and were going to build Antosat-2 as a replacement for Angosat-1. He did not specify the details of the transaction, however. In the meantime, the Angolan news agency Angop quoted Jose Carvalho da Rocha said on Monday the Angolan government had recognized the dysfunctional character of Angosat-1. It recalled that the satellite was built in 2012 under a bilateral agreement signed in 2009. Angosat-1 cost $ 360 million but other sources posted the cost of $ 320 million. According to Jornal de Angola, construction of Angosat-2 is unlikely to take more than 18 months. Insurance indemnity for the lost satellite in the amount of $ 121 million will be incorporated in the payment for the second satellite.